The facts do not support either of these claims. The destruction of the Second Temple in the year 70 C.E. did not spell the end of Jewish activities on the Temple Mount. For many centuries, Jews continued their attachment to the site by maintaining a physical presence on the mountain. And when they were prevented from doing so, they prayed three times a day for the speedy renewal of the sacrificial service in a restored temple. Stones from the destroyed temple can be seen here. Contrary to what many believe, Jews did not abandon the Temple Mount after the temple's actual destruction in 70 C.E. There is even evidence that sacrifices continued for some time on a surviving altar. It was only after the Bar Kochba revolt (132-35 C.E.) that Jews were barred from the site and from Jerusalem by the victorious and vindictive Emperor Hadrian. Both the first and second temples were located in a mountainous portion of Jerusalem that Jewish tradition identified with the biblical Mount Moriah, site of Abraham's attempted sacrifice of Isaac. Over time, the site was referred to as the Temple Mount (Har Habayit), and it was here that Herod (r. 37-4 B.C.E.) transformed a relatively small structure into a wonder of the ancient world. However, the magnificent edifice he built stood for less than a hundred years; it was destroyed in 70 C.E., three years after a Jewish rebellion against Roman rule broke out. The Jewish people's response to this cataclysmic event is in some sense the entire post-70 history of the Jews as they built institutions and created an entire culture that kept the people alive for millennia. But what role did the actual Temple Mount play in their lives after its physical destruction? Despite the conventional wisdom that the Jewish people were banished from this holy site, the evidence suggests that Jews continued to maintain a strong connection to and frequently even a presence on the Temple Mount for the next two thousand years. Even when they were physically prevented from ascending the site, their attachment to Har Habayit remained strong and vibrant. Once the Jewish revolt had been put down, Jews were again permitted to visit the site of the former temple since the Romans generally did not object to the worship of local gods. As far as they were concerned, once the rebellion was suppressed, there was no longer any impediment to Jewish worship on the mount. Many stories in the Talmud testify to the fact that leading rabbis continued to pray on the now desolate Temple Mount. Ascent to the Temple Mount was not limited to rabbis; the people's attachment to the former sanctuary also remained very strong. One story relates that "Ben Zoma once saw a [large] crowd on one of the steps of the Temple Mount." The people continued to bring sacrifices that were offered on a Temple Mount altar that had survived the destructive fire by the Romans. The Mishnah, a central code of Jewish law codified in the early third century C.E., states that "one may offer sacrifices [on the place where the temple used to stand] even though there is no house [i.e., temple]." Some rabbis held that the sacrificial services continued almost without interruption for sixty-five years following the temple's destruction while others suggest that sacrificial services ceased in 70 C.E. but were resumed for the 3-year period when Bar Kochba controlled Jerusalem. Not only did the Jews continue to offer sacrifices and prayer on the mount, but at least once in the half-century following the temple's destruction, they began to build a new edifice for a third temple. Emperor Hadrian (76-138), eager to gain the cooperation of the Jews, granted them permission to rebuild their temple. The Jews started to make the necessary preparations, but before long, Hadrian, at the instigation of the Samaritans, went back on his word and the project was stopped. Following the defeat of the Bar Kochba rebellion in 135 C.E., Jews were barred for the first time from the Temple Mount. The victorious and vindictive Emperor Hadrian ordered that the Temple Mount be ploughed under and issued strict orders prohibiting Jews from living in Jerusalem and from praying on the Temple Mount. As an alternative, Jews assembled for prayer on the Mount of Olives from whence they had an unobstructed view of the temple ruins. While this prohibition was strictly enforced during Hadrian's lifetime, Jews did pray on the Temple Mount at various times during the second and the third centuries because the prohibition was not always fully enforced. Some scholars question whether Hadrian's decree was ever legally formulated, but all agree that a policy of prohibiting Jews in Jerusalem and on the Temple Mount was in effect. The transformation of the pagan Roman Empire into a Christian realm early in the fourth century marked a decisive turning point in the history of the Western world. Under pagan rule, Jerusalem had become a relatively insignificant provincial city, but now it attracted many pilgrims who came to worship at Christian holy sites. A new church, the Basilica of the Holy Sepulcher, was built on the purported site of Jesus' crucifixion and became the city's central religious site. Until the Crusader conquest of the city eight centuries later, the importance of the Temple Mount was deliberately de-emphasized. Though many churches and other religious buildings were erected throughout the city at sites associated with the life of Jesus, only one or two were built on the Temple Mount. Until recently, it was widely believed that in the Byzantine period the Temple Mount was deliberately abandoned by Christians and turned into the local garbage dump in order to fulfill the New Testament prediction that the temple would be totally destroyed and "not one stone will be left here upon another." These views were challenged by the recent publication of suppressed archeological findings. The excavations, the only ones ever permitted on the Temple Mount by the Muslim waqf in modern times, were conducted by British archeologists in the 1930s. Under al-Aqsa mosque, they found evidence of a mosaic floor, dated to the fifth to seventh centuries, that was quite similar to floors of churches found in Bethlehem. Most likely they are remnants of a Byzantine church that was built on the Temple Mount—contrary to the accepted theories. Emperor Constantine (272-357) renewed the laws that prohibited Jews from living in or even visiting Christian Jerusalem, allowing access to the Temple Mount once a year on Tisha b'Av (the ninth of the Hebrew month of Av, the anniversary of the day the temples were destroyed). In 333, the anonymous Pilgrim of Bordeaux described in some detail the desolate Temple Mount, noting a "perforated stone" (perhaps today's Foundation Stone found in the Dome of the Rock), which the Jews anointed with oil once a year on Tisha b'Av. On this day, he heard the Jews recite the Book of Lamentations on the Temple Mount and saw them tear their clothes as a sign of mourning. Later Byzantine writers, including Jerome, corroborate that Jews continued these mourning practices on the actual Temple Mount. Constantine's nephew Julian, who became emperor in 361 C.E., turned his back on Christianity and issued an edict of universal religious toleration for all—pagans, Jews, and Christians. He reversed the ban against Jews in Jerusalem early in his reign. In 363 C.E., Julian promised to help rebuild the temple in Jerusalem; among Diaspora Jews, his pledge was greeted with great enthusiasm although some rabbis were apprehensive about the undertaking, hesitating to engage in building the Third Temple prior to the arrival of the messiah. Julian, nonetheless, went ahead with the project and ordered the imperial treasury to make available large sums of money and building materials. Many Jews came to Jerusalem to assist the skilled craftsmen and masons in the removal of the existing foundation, the first step in the rebuilding project. Christian residents of the city were vigorous in their opposition to any attempt to rebuild the temple. Many gathered in the Church of the Holy Sepulcher to pray for the termination of the project. It would seem their prayers were answered since all work halted abruptly in the summer of 363; whether this was due to arson, an earthquake, or merely Julian's death on the Persian front is a matter of some dispute. Julian's successor, a devout Christian, immediately canceled the temple-rebuilding effort. By the latter part of the fourth century, the Temple Mount had disappeared completely from the landscape of Christian Jerusalem. The pilgrim Egeria who visited Jerusalem in the early 380s provided a detailed description of the city in letters to her friends, but she made no mention of the Temple Mount. Similarly, the mosaic world map of Medaba from the mid-sixth century depicts Jerusalem in great detail but omits the Temple Mount altogether as does a seventh-century Armenian account of the city's holy places. Jews, on the other hand, never forgot the Temple Mount even when none of the original temple buildings remained standing. Wherever they lived, they faced Jerusalem three times every day and prayed for the restoration of the temple and the renewal of the sacrificial service. Furthermore, there are indications that despite imperial bans, some Jews continued to pray on the Temple Mount. The late fourth-century sage Rabbi Bibi offered instructions to those who went to the Temple Mount to ensure their behavior would not degrade the holiness of the place. A sixth-century aggadic work, Midrash Shir Hashirim Rabba, includes an instruction for Jews everywhere to face in the direction of the Temple Mount when praying, adding that "and those who pray on the Temple Mount should turn to the Holy of Holies," an injunction that only makes sense if the ban was not strictly enforced. The Jewish people's continued attachment to the Temple Mount is exemplified by an event that occurred during the reign of the Roman Empress Eudocia (401-60). When she went on a pilgrimage to the Holy Land in 438, she was greeted warmly by Jews everywhere, probably as a result of her policy of supporting non-Christians. When the leading rabbis asked her for permission to once again ascend the Temple Mount, she immediately agreed. Great excitement gripped the local Jewish leaders who sent letters to other communities throughout the world informing them of the good news and asking them to come on pilgrimage to Jerusalem for the coming Sukkot festival. More than 100,000 Jews came to Jerusalem that year, but once again, Jerusalem's Christians launched a violent protest and blocked access to the mountain. For almost two centuries after this incident, Jews were forbidden to live in Jerusalem. Until the Persian conquest in 618, Jerusalem was officially a city without Jews. This would change dramatically under the brief period of Persian rule and the subsequent, and far lengthier, era of Muslim hegemony. For centuries, Persian and Roman (later Byzantine) armies had battled each other over the fringes of their respective empires. The invasion of Palestine by King Khosru II of Persia in 613-14 C.E. succeeded in briefly wresting control of Jerusalem from Constantinople. Khosru was aided by Babylonian Jewry who supplied 30,000 Jewish soldiers in return for a promise that they would participate in the capture of Jerusalem and that a Jewish governor would be appointed to rule over the city. Once the city was captured, the Persians appointed Nehemiah ben Hushiel as governor, and the new governor lost no time in reestablishing the sacrificial service on the Temple Mount. When Assyria [Persia] came to the city … and pitched his tents there / the holy people [Jews] were a bit relieved / because he permitted the reestablishment of the Temple / and they built there the holy altar / and offered upon it holy sacrifices / but they did not manage to build the Temple / because the Messiah had not yet come. But once again, this return to the Temple Mount was short-lived. Nehemiah was soon executed either out of fear of his messianic pretensions or because the support of the city's larger Christian population was preferred over that of the smaller number of Jews. In any event, in 629, only ten years after the conquest, the Persians lost control of the city to the Byzantines who were subsequently defeated by victorious Arab forces sweeping out of the desert. Jerusalem was conquered by Arab forces in May 638, an accomplishment ascribed by Muslim sources to the Caliph Umar. In return for assistance in the taking of the city, the Jews received the right to reside in Jerusalem and to pray on the Temple Mount without interference. In 680, fifty years after Umar's conquest of Jerusalem, the Damascus-based Umayyad dynasty engaged in a struggle for control of the Muslim world with a rebel dynasty based in Mecca. The Umayyads opted to fight the rebels by damaging Mecca's economy, which was based almost entirely on revenues from Muslim pilgrims. Their secret weapon was to create a competing pilgrimage site by building a magnificent edifice, the Dome of the Rock, on the site of the destroyed Jewish temple and hoping that this mosque would weaken Mecca's economy by siphoning off pilgrims from Mecca. Thus, a political strategy designed to fight mutineers in far-off Mecca transformed Jerusalem's Temple Mount into a Muslim holy site with far-reaching implications to this day. But the metamorphosis of the Temple Mount into Islam's third holiest site did not result in a total exclusion of Jews from the location. Soon after the Muslim conquest, Jews received permission to build a synagogue on the Temple Mount. Perhaps the wooden structure that was built over the Foundation Stone was first intended for a synagogue, but even before it was completed, the site was expropriated by the city's rulers. The Jews received another site on the mount for a synagogue in compensation for the expropriated building. Most probably there was an active synagogue on the Temple Mount during most of the early Muslim period. Solomon ben Jeroham, a Karaite (a medieval Jewish sectarian) exegete who lived in Jerusalem between 940 and 960, affirmed that Jews were permitted to pray on the Temple Mount, noting that "the courtyards of the Temple were turned over to them and they prayed there [on the Temple Mount] for many years." Al-Aqsa Mosque (the Furthest Mosque), the second mosque on the Temple Mount, was built in 715 and was linked to a Muslim legend, based on an ambiguous verse in the Qur'an concerning Muhammad's night journey to heaven. In this way, the Umayyads cleverly associated Muhammad's life with Jerusalem even though the prophet died years before the city's capture by the Muslims. This construction further cemented the site's holiness to Islam. Nonetheless, during this first phase of Islamic governance, Muslim rulers were generally tolerant of Jewish activities on the mountain. Whenever a more intolerant ruler assumed control of the city, Jews were forbidden from praying on the mount but instead worshipped at one of the many Temple Mount gates; an eleventh-century document found in the geniza or storeroom of a Cairo synagogue describes the circuit followed by the pilgrims and the prayers they recited at each of the gates. After the conquest of Jerusalem by the army of the Fatimid dynasty (969), a Temple Mount synagogue was rebuilt and used until the Jews were banished by Caliph al-Hakim in 1015. When a subsequent ruler canceled Hakim's eviction order, the Jews again returned to this synagogue on the Temple Mount and worshipped there until the conquest of Jerusalem by the Crusaders. Hebrew writings found on the internal walls of the Golden Gate are believed to have been written by Jewish pilgrims at least one thousand years ago, thus testifying once again to the continued Jewish attachment to and presence on the Temple Mount in this era. The early Arab rulers of Jerusalem for the most part did not destroy or confiscate any of the city's churches. Although charged an entrance toll, Christian pilgrims continued to visit their sacred shrines. This religious tolerance came to an end when the Seljuk Turks swarmed out of Central Asia in the latter part of the eleventh century and captured Jerusalem in 1071. Assaults on pilgrims and attacks on churches became commonplace. As reports of these anti-Christian activities reached Europe, Pope Urban II in 1095 demanded that Christians rescue the Holy Land from the "infidel," an appeal that resulted in the First Crusade. Within hours of breaching the walls of Jerusalem in 1099, the victorious Crusaders had massacred almost all of the city's Jewish and Muslim inhabitants. The Crusaders ascended the Temple Mount and after giving thanks to God for their victory, converted the mosques into churches, renaming the Dome of the Rock the Temple of God (Templum Domini) and al-Aqsa Mosque, the Temple of Solomon (Templum Solomnis). The mount was declared off-limits to all non-Christians and became the center of religious and civil life in Crusader Jerusalem. Despite the prohibition, Jews continued to ascend the mount even during the Crusader period. The prominent medieval Jewish commentator and leader Maimonides (1135-1204) wrote in a letter in 1165 that he "entered the Great and Holy House [and] prayed there." The Jewish traveler, Benjamin of Tudela, who visited Jerusalem sometime between 1159 and 1172, also recorded Jews praying "in front of the Western Wall [of the Dome of the Rock], one of the [remaining] walls of what was once the Holy of Holies." Thus, even in one of the darkest and most intolerant periods of Jewish history, the faithful did not abandon the Temple Mount. Less than a century later, the Kurdish Muslim warrior Saladin regained control of the city, thus putting an end to the Crusader Kingdom of Jerusalem in October 1187. Even though the Temple Mount was re-consecrated as a Muslim sanctuary, Saladin permitted both Jews and Muslims to settle in Jerusalem and to worship on the Temple Mount. The Muslim authorities permitted Jews to erect a synagogue on the site although the situation vacillated over the next few centuries. For example, Saladin, who at first had urged Jews to come back to Jerusalem, a few years later forbade them to go on the Temple Mount. From the late thirteenth century to the mid-nineteenth, the mountain was, for the most part, off-limits to Jews with occasional interludes of access. During the first millennium following the destruction of the Second Temple, Jews did not hesitate to ascend the mount, but by the Middle Ages, two distinct halakhic (Jewish religious law) views on the permissibility of doing so had crystallized. The dispute centered largely on issues of the degrees of holiness associated with the areas where the temple once stood and on whether Jews who could no longer attain ritual purity might inadvertently enter the location of the former temple. According to most rabbinic authorities, in the first centuries after the temple's destruction, it was permissible to walk on the Temple Mount because the ashes of the Red Heifer, which were necessary for attaining ritual purity, were still available. But by the medieval period, these ashes were no longer available, and thus prevented Jews from achieving ritual purity. Under these circumstances, Maimonides taught, "Even though the Temple is in ruins today due to our sins, everyone is obligated to revere it like when it was standing … one is not permitted to enter any place that is forbidden." On the other hand, Rabbi Avraham ben David of Provence [Raavad] (c.1125-98), the author of critical glosses on Maimonides' Mishneh Torah, concluded that "one who enters [the Temple Mount] nowadays does not receive the penalty of karet [literally, cutting off]." Though there are various interpretations of the meaning of Raavad's gloss, he probably held that the Temple Mount without a temple no longer had its original holiness. In the subsequent halakhic literature, the vast majority of rabbinical authorities "built a fence around" Maimonides' conclusion and forbade entering any part of the Temple Mount, fearing that some might inadvertently enter a forbidden area. Of the classical authorities, only Rabbi Menachem Meiri (1249-1316), a noted French Talmudic scholar, expressed the view that in his days it was permissible for Jews to enter the Temple Mount. And yet Jewish attachment to this ruined site persisted. In 1211, three hundred European rabbis, mostly from England and France, embarked for the Holy Land. One, Rabbi Shmuel ben R. Shimshon, wrote about his visit to the Temple Mount. Early in the fourteenth century, Rabbi Ishtori Haparchi (1280-1366) wrote in his halakhic and geographic book Kaftor ve-Ferah about an earlier rabbinic ruling that urged people to come to Jerusalem and offer sacrifices on the Temple Mount. While nothing apparently came of these plans, it is significant that a noted authority of the period could contemplate such an act, despite the self-imposed rabbinic ban. Toward the end of the Mamluk period, there is evidence from the chief rabbi of Jerusalem, David ben Shlomo Ibn Zimra (1479-1573), who wrote that the city's Jews regularly went to the Temple Mount in order to view the entire temple ruins and pray there. He added that "we have not heard or seen anyone object to this." With the Ottoman conquest of Jerusalem in 1516, the relationship between the Jewish people and the Temple Mount entered a new phase. Sultan Suleiman I (the Magnificent, 1494-1566) ordered the rebuilding of the city's walls and encouraged many European Jews, especially those who had been expelled from Spain and Portugal a generation earlier, to settle in the Holy City. Suleiman also instructed his court architect to prepare a place for Jewish prayer in an alley at the bottom of the Western retaining wall of the Temple Mount because he had prohibited all non-Muslims from entering any part of the Temple Mount. A royal decree was issued that guaranteed for all times the right of Jews to pray at this Western Wall in compensation for the Jews' relinquishing their legal rights to pray on the mount itself. Subsequent Ottoman rulers invested little effort in the upkeep of the Dome of the Rock or al-Aqsa Mosque. There are no records of important Muslim clerics or kings or even large crowds of ordinary Muslims praying on the Temple Mount. Even those rabbinical authorities, who agreed in theory with the precedents that permitted ascent, hedged their rulings in view of the actual situation on the ground. Rabbi Yosef Di'Trani, who visited Jerusalem during the 1590s, noted that there were locations on the southern and eastern sides of the Temple Mount where Jews could walk freely without any concern of entering a prohibited area, but he ruled that Jews should, nonetheless, avoid going there because they were not ritually clean. In the nineteenth century, students of the rabbinical giant, the Vilna Gaon, arrived in Jerusalem and became the prototype of today's ultra-Orthodox haredi community. The leader of this group, Rabbi Yisrael of Shklov (d. 1839), held that though there were areas on the Temple Mount that they were allowed to enter, Jews were, nevertheless, forbidden to ascend as the exact location of these permitted areas was in some doubt. This ruling became the normative position of the Orthodox world for the next 150 years. Despite rabbinical decrees prohibiting access to the mountain and the death penalty threat for any Jew caught on the mountain, the deep-seated Jewish attachment to the Temple Mount remained strong. An unknown number of Jews ascended the mountain surreptitiously during these centuries. No records were kept of these visits because of their clandestine nature, but occasional references in Muslim court records and travelers' accounts give evidence of their occurrence. In the aftermath of the Crimean War (1853-56), the Temple Mount was opened daily (except on Fridays) to all visitors, regardless of their religion—a concession demanded by the victorious British. Nevertheless, the Jerusalem rabbis again issued a decree prohibiting Jews from going up, threatening to put any Jew who ignored their ruling under the ban, a form of rabbinical excommunication from the community. While the vast majority of Jews abided by the decree, many ignored it, including prominent visitors, such as Sir Moses Montefiore and Baron Edmond de Rothschild. Many of the new secular settlers also disregarded the rabbinical instructions and visited the site. Rabbi Abraham Isaac Kook (1865–1935), the first Ashkenazi chief rabbi of the Jewish community in Mandatory Palestine, repeatedly prohibited entering any part of the Temple Mount, a position also reiterated by his successor Rabbi Isaac Herzog (1888-1959). Herzog testified in 1938 before the British Partition Committee that Jews were not allowed to go onto the Temple Mount until the coming of the messiah. Just before the outbreak of the 1948 War of Independence, Herzog instructed Gen. David Shaltiel, the Jerusalem sector commander of the Jewish underground forces, that should his forces capture the Temple Mount, they should make every effort to expel all enemy soldiers, but once they had accomplished this task they were to leave the Temple Mount as quickly as possible because of the holiness of the place. These instructions became moot since the Jordanian army succeeded in occupying all of the Old City, including the Temple Mount. For the next nineteen years, no Jew was allowed to approach the Western Wall or the Temple Mount despite provisions in the Jordan-Israel armistice agreement that called for free access to all holy places. In June 1967, on the second day of the Six-Day War, Israeli paratroopers entered Jerusalem's Old City and made their way to the Temple Mount; Col. Mordechai Gur, the brigade's commander, soon broadcast a momentous message to the Israeli nation: "The Temple Mount is [again] in our hands." For the first time in almost two thousand years, the Temple Mount was under the control of a sovereign Jewish people. Gur ordered three paratroopers to climb to the top of the Dome of the Rock and unfurl an Israeli flag over it; four hours later Defense Minister Moshe Dayan ordered the flag taken down. This order initiated a schizophrenic diplomatic and political state of affairs that continues to this day. Dayan proclaimed that, henceforth, there would be unrestricted Jewish access to the Temple Mount. This compound was our Temple Mount. Here stood our Temple during ancient time, and it would be inconceivable for Jews not to be able freely to visit this holy place now that Jerusalem is under our rule. When we arrived on the Temple Mount, I blew the shofar, fell on the ground and prostrated myself in the direction of the Holy of Holies, as was customary in the days when the Temple still stood. … [Later] I found General Moti Gur sitting in front of the Omar Mosque. He asked me if I wanted to enter, and I answered him that today I had issued a ruling permitting all soldiers to enter because soldiers are obligated to do so on the day when they conquer the Temple Mount in order to clear it of enemy soldiers and to make certain that no booby traps were left behind. … I took along a Torah scroll and a shofar and we entered the building. I think that this was the first time since the destruction of the Temple almost two thousand years ago that a Torah scroll had been brought into the holy site which is where the Temple was located. Inside I read Psalm 49, blew the shofar, and encircled the Foundation Stone with a Torah in my hand. Then we exited. Some weeks later Rabbi Goren established a synagogue and study hall, as well as his office, on the Temple Mount and held organized study and prayers on the site. But within days, Goren's efforts were brought to a halt. At the behest of Dayan, the Israeli government prohibited Rabbi Goren from undertaking any further activities on the mount. As a result of another government decision that same year, the general public, including Jews and Christians, was allowed to visit the Temple Mount without hindrance but not to pray there. Many visitors have taken advantage of this permission, but most observant Jews continued to follow the instructions of the chief rabbinate, which prohibit Jews from entering the mount because of the issue of ritual impurity. A small number of rabbis have followed Rabbi Goren's plea to permit and encourage Jews to visit those areas on the Temple Mount that do not require complete ritual purity. At the outbreak of "al-Aqsa intifada" in September 2000, the Temple Mount was closed to all non-Muslims because it was feared that the area might become a tinderbox of clashes with Palestinians. The mount was reopened to non-Muslims in August 2003, but visiting hours were severely curtailed with the authority of the waqf (Islamic religious endowment), the Muslim custodians of the Temple Mount, increasing in significance. During certain hours, Jews and Christians are allowed to go up to the mount but only if they conform to a strict set of guidelines, including a ban on prayer and bringing any "holy objects" to the site. Visitors are forbidden from entering any of the mosques without direct waqf permission; rules are enforced by waqf agents, who watch tourists closely and alert nearby Israeli police to any infractions. Thus despite the fact that the Israeli parliament passed laws ensuring freedom of worship to all at every holy site, Jewish prayer on any part of the Temple Mount continues to be prohibited. Even after the Roman armies destroyed the temple in 70 C.E., the Jews never abandoned the site. 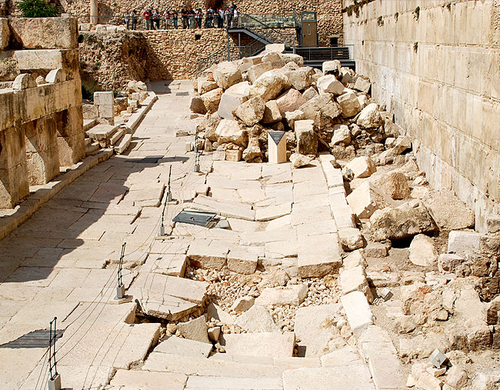 No matter what obstacles or decrees others placed in their way, Jews continued to ascend and pray at or near the area where their temple once stood. Whenever their physical presence on the mountain was outlawed, they selected alternate prayer sites, such as the Mount of Olives from where the Temple Mount could be seen. In more recent times, the Western Wall served as such an alternative. But even during those periods, Jews attempted, legally or otherwise, to go up unto the mountain to pray. In recent decades, despite the opposition of the Muslim waqf and the Jewish chief rabbinate, the number of Jews going up on the Temple Mount in order to pray has increased year-by-year. Against this backdrop, the continued denial that Jews have any connection with the Temple Mount cannot but pose a formidable obstacle to a settlement of the Arab-Israel conflict. F. M. Loewenberg is a professor emeritus at Bar-Ilan-University and lives in Efrat, Israel. David Barnett, "The Mounting Problem of Temple Denial," Meria Journal, June 2011. Eli Schiller, Kipat ha-Sela Even Hash'tiya (Jerusalem: Ariel, 1976), pp. 19-28. Rashi's comment on the Babylonian Talmud (hereafter, BT), Pesachim 88a. See BT, Makkot 24b; BT, Shabbat 15a; BT, Rosh Hashanah 31a; BT, Sanhedrin 11b; BT, Avoda Zara 20a. BT, Berakhot 58a; see, also, Mordechai Fogelman, Beit Mordechai (Jerusalem: Mossad Harav Kook, 2009), p. 205. Mishnah (M) Eduyot 8.6; see also Maimonides, Hilkhot Bet Ha-bechira 6.15. M Eduyot 8.6; Maimonides, Hilkhot Bet Ha-bechira 6.15; Ha'emek Davar commentary on Leviticus 26.31. Oded Irshai, "Ha-issur shehetil Konstantinus Hagadol al k'nissat Yehudim Lirushalayim," Zion, 60 (1996), pp. 129-78; J. Rendel Harris, "Hadrian's decree of expulsion of the Jews from Jerusalem," Harvard Theological Review, 19 (1926), pp. 199-206. Galyn Wiemers, "Jerusalem 101: An introduction to the city of Jerusalem," Generation Word, West Des Moines, Iowa., accessed Apr. 24, 2013. Matthew 24:2, Mark 13:2, Luke 21:6. Etgar Lefkovits, "Was the Aksa Mosque built over the remains of a Byzantine church?" Jerusalem Post, Nov. 16, 2008; Leen Ritmeyer, "Third Jewish Mikveh and a Byzantine Mosaic Floor Discovered on the Temple Mount," Ritmeyer Archeological Design, Nov. 17, 2008; Israel Hayom (Tel Aviv), June 29, 2012. Irshai, "Ha-issur shehetil Konstantinus Hagadol al k'nissat Yehudim Lirushalayim," pp. 129-78. Michael Avi-Yonah, The Jews of Palestine: A Political History from the Bar Kokhba War to the Arab Conquest (Jerusalem: Magnes Press, 1984), p. 81; Menachem Elon, Temple Mount Faithful-Amutah et al v. Attorney-General, et al., in the Supreme Court Sitting as the High Court of Justice, Sept. 23, 1993, in Catholic University Law Review, Spring 1996, pp. 890-2. Jerome's commentary on Zephaniah 1.6. Ephraem the Syrian, Bibliothek der Kirchenväter, A. Rücker, trans., 20 (1919), First Song, p. 16; Gregory of Nazianzus, Oratio V contra Julianum, 4 (GCS 35), c. 668. Philostorgius, Historia ecclesiastica, Joseph Bidez, ed. (Berlin: Winkelman and Friedhelm, 1972), p. 297. Avi-Yonah, The Jews of Palestine, pp. 196-200; Gunter Stemberger, Jews and Christians in the Holy Land—Palestine in the Fourth Century (Edinburgh: Clark, 2000), p. 208; Robert Panella, "The Emperor Julian and the God of the Jews," Koinonia, 23 (1999), pp. 15-31; Kenneth W. Russell, "The Earthquake of May 19, AD 363," The Bulletin of the American Schools of Oriental Research, Spring 1980, pp. 47-64; David B. Levenson, "The ancient and medieval sources for the Emperor Julian's attempt to rebuild the Jerusalem Temple," The Journal for the Study of Judaism, 4 (2004), pp. 409-60. M. L. McClure and C. L. Feltoe, ed. and trans., The Pilgrimage of Etheria (London: Society for Promoting Christian Knowledge, 1919). E. W. Brooks, "An Armenian Visitor to Jerusalem in the Seventh Century," English Historical Review, 11(1896), pp. 93-7. JT, Berakhot 2.4(17a), Midrash Tanchuma Ki Tavo 1. Midrash Shir Hashirim Rabba 4. Michael Gaddis, There Is No Crime for Those Who Have Christ: Religious Violence in the Christian Empire (Berkeley: University of California Press, 2005), p. 246; Kenneth Holum, Theodosian Empresses (Berkeley: University of California Press, 1989), p. 217. Some scholars question the existence of this treaty. See, Elisabeth Campagner, "Eine jüdische Apokalypse des 7. Jahrhunderts? Kaiser Heraklius als Antichrist?" Internet Zeitschrift fur Kulturwissenschaft, Sept. 5, 2002, pp. 1-43. Ezra Fleischer, "L'pitaron sh'elat z'mano u'makom p'ulato shel R' Elazar Biribi Kilir," Tarbiz, 54 (1985), p. 401. Jacob Mann, The Jews in Egypt and in Palestine under the Fatimid Caliphate (Ithaca: Cornell University Library, 1920), vol. 2, pp. 188-9; Ben-Zion Dinor (Dinaburg), "Bet Tefila u'midrash l'yehudim al har habayit bi'mey ha'aravim," Zion, 3 (1929), pp. 54-87. "The riddle of the Dome of the Rock: Was it built as a Jewish place of prayer?" The Voice of the Temple Mount Faithful (Jerusalem), Summer 2001; Abraham Benisch, trans., Travels of Rabbi Petachia of Ratisbon (London: The Jewish Chronicle Office, 1856); Robert Bedrosian, trans., Sebeos' History of Armenia (New York: Sources of the Armenian Tradition, 1985), chap. 31. Dinor, "Bet Tefila u'midrash l'yehudim al har habayit bi'mey ha'aravim," pp. 54-87; for another view, see Jacob Mann, Texts and Studies in Jewish History and Literature (New York: Ktav Publisher, 1970), vol. 1, pp. 313-5. Solomon ben Jeroham, comment on Psalm 30, cited by Shlomo Goren, Sefer Har Habayit, rev. ed. (Jerusalem: Ha-idra Rabba, 2004), p. 314. Dan Bahat, "Identification of the Gates of the Temple Mount and the 'Cave' in the Early Muslim Period," Catedra, 106 (2002), pp. 61-86; Abraham Ya'ari, ed., Igarot Eretz Yisrael (Tel Aviv: Gazit, 1943), pp. 48-53. Shulamit Gera, "Ha-ketuvot b'otiot ivri'ot b'sha'ar harahamim," Catedra, 61 (1991), pp. 176-81. Salo Wittmayer Baron, A Social and Religious History of the Jews, 2nd ed. (Philadelphia: Jewish Publication Society, 1957), vol. 4, p. 109; Hamilton Alexander Rosskeen Gibb, The Damascus Chronicle of the Crusades: Extracted and Translated from the Chronicle of Ibn Al-Qalanisi (Mineola, N.Y.: Dover, 2003), p. 48. Thomas Madden, The New Concise History of the Crusades (Lanham, Md. : Rowman and Littlefield, 2005), p. 212; Baron, A Social and Religious History of the Jews, p. 109. R. Elazar Ezkari, Sefer Haredim (Mitzvah 83); Yitzhak Shilat, "B'niyat Bet Knesset b'Har Habayit B'yameinu," Tehumin 7, 1986, pp. 489-512. The Western Wall Benjamin described was not the present Western Wall (which did not become a site for prayer until the sixteenth century) but the ruins of the western wall of the Second Temple building on the Temple Mount. Benjamin of Tudela, The Itinerary of Benjamin of Tudela (Jerusalem: Hebrew University, 1960), pp. 20-4. Emil Offenbacher, "Prayer on the Temple Mount," Jerusalem Quarterly, 36 (1985), p. 134. Eliezer Brodt, "Eimatai paska taharat afar para aduma," Tradition Seforim Blog, 2009. Maimonides, Hilchot Beit Habechira 7:7. Raavad's gloss on Maimonides, Hilchot Beit Habechira 6:14. Menachem Meiri, Beit Habechira on BT, Shavuot 16a. Ya'ari, Igarot Eretz Yisrael, p. 78. Ishtori Haparchi, Kaftor v'Ferah, J. Blumenfeld, ed. (New York: Beit Hillel, 1958), p. 214, n. 17. Responsa of the Radbaz, vol. 2, no. 691; Tuvya Sagiv, "Ha-knissa l'Har Habayit—T'shuvat Haradbaz," in Yehuda Shaviv, ed., Kumo v'Na'aleh (Alon Shvut: Machon Tzomet, 2003), pp. 46-81. Joseph Schwartz, Geography of Palestine, I. Leeser, trans. (Philadelphia: A. Hart, 1850), p. 260. Manfred R. Lehmann, "The Moslem Claim to Jerusalem Is False," Algemeiner Journal, Aug. 19, 1994. Israel of Shklov, P'at Hashulchan, H. Eretz Yisrael (Ramat Gan: Re'ut, 2000), sect. 3:11-12; idem, Bet Yisrael commentary (Safed: n.p., 1836), subsec. 26. Amnon Cohen, Jews in Moslem Religious Courts: 16th Century (Jerusalem: Ben Tzvi, 1993), doc. 104, May 4, 1551, pp. 114-5, doc 107, May 19, 1554, p. 117; Schwartz, Geography of Palestine, pp. 417-8. Dotan Goren, "Ha-aliya l'Har habayit ul'Makom ha-Mikdash b'tram ha-medina," E-mago, 2007. Moshe Dayan, Story of My Life (New York: Morrow and Company, 1976), p. 390. Shlomo Goren, "Selection from Personal Diary on the Conquest of Jerusalem," cited in Shabbaton, no. 422, May 29, 2009. Yoel Cohen, "The Political Role of the Israeli Chief Rabbinate in the Temple Mount Question," Jewish Political Studies Review, Spring 1999, p. 108; Goren, Sefer Har Habayit, pp. 30-3. Matti Friedman, "On the Temple Mount, a battle brews over Jewish prayer," Times of Israel, Mar. 12, 2013. Related Topics: Israel & Zionism, Jerusalem, Jews and Judaism | F.M. Loewenberg | Summer 2013 MEQ receive the latest by email: subscribe to the free mef mailing list This text may be reposted or forwarded so long as it is presented as an integral whole with complete and accurate information provided about its author, date, place of publication, and original URL.